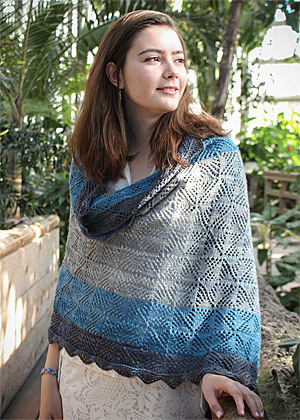 Pinwheel is in Knitty, which means it’s free! 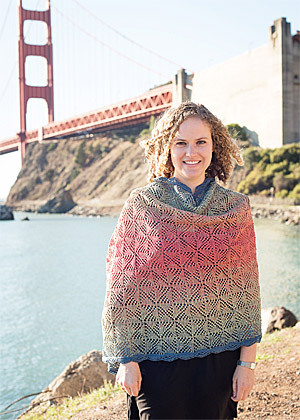 Inspired by Fall blanket wraps, Spring weather, and some lovely Wolle’s Yarn Creation Color Changing Cotton, I began to imagine bringing these elements together in a light spring lace shawl. To keep a rectangular shape and showcase the gradient yarn from the center out, the scarf would need to begin with a provisional cast-on, much like a toe-up sock. Looking for a pattern that could give the illusion of being worked in one direction while actually rotating 360 degrees, I came across Barbara Walker’s Vortex. With a few modifications it looks the same every time it rotates 90 degrees, making the provisional cast-on a seamless part of the design. When looking at the pattern up close, I saw lace bowties, but viewed from farther away, the solid areas reminded me of pinwheels. Thinking about how pinwheels spin and still look the same, it was the perfect name. After adding a sideways knit-on border that repeated the alternating lace and solid triangles, Pinwheel was complete. Looking at the design, I thought it would also lend itself to bold concentric rectangles. Fortunately, I had some lovely Mrs. Crosby Hatbox that seemed perfect. The resulting shawls are like fraternal twins, obviously related, but with different personalities. Finally, a friend showed me how to turn a long rectangular shawl into a loose swingy vest, so the shawl can go from dressy to casual with a couple of folds and your favorite shawl pin.